On 1-Aug-10 a couple were kayaking down the Jordan River south of Salt Lake City. Just after passing beneath the bridge at Winchester St. their kayak capsized. The couple tried to swim to safety, but by the time the fire department arrived, the couple had drowned. Their bodies were recovered less than 20ft from the point where their kayak had capsized. The couple had become trapped. They were not trapped by solid objects, but by a dangerous current present in the river. This dangerous current developed just downstream of a small drop less than 3ft high as seen in Figure 1. The water on the surface of the river just below the drop was not moving downstream, but was moving upstream, back toward the drop. Figure 2 shows a longitudinal view of this type of current; due to the recirculating nature of the current it is often called a "roller" or "hydraulic". Figure 1 - A couple drown at this site in August 2010. Figure 2 - Profile view of a "roller". Courtesy of Wright Water Engineers, Inc. and ASDSO. An important phenomenon responsible for dissipating energy in a channel is the hydraulic jump. A hydraulic jump occurs in a channel when shallow, high velocity (supercritical) water meets slower moving (subcritical) water. The short and turbulent transition between the two water depths is called a hydraulic jump. An image of a hydraulic jump can be seen in Figure 3. When there is a large amount of excess energy in a channel it can be dissipated by a hydraulic jump. At many overflow structures, especially large ones, a stilling basin may be installed to control and confine the resulting hydraulic jump. At many smaller low-head structures stilling basins are not installed, as a result the hydraulic jumps near these structures may not be well controlled. If the high energy water flowing over a drop structure (headwater) can force the water away from the downstream face of the structure, then a "fully developed" hydraulic jump can occur, much like the one in Figure 4. A fully developed hydraulic jump is relatively safe for human passage. Figure 3 - A hydraulic jump in the lab. Flow moves toward the right. Figure 4 - Profile of a "swept out" hydraulic jump. The current can become dangerous when the water downstream of the structure (tailwater) is too deep for a fully developed hydraulic jump to form. Figure 5 shows the situation where the current may pose a significant public safety hazard. This current occurs when the falling water, or nappe, meets a body of slow moving water and travels to the bottom of the channel. The water entrains a significant amount of air as it plunges to the bottom of the channel. Momentum causes the air entrained water to travel downstream along the bottom of the channel. Once the buoyant force of the entrained air can overcome the inertial forces of the water, it will begin to rise. The force of the rising air creates a strong current. By the time this current has reached the surface it may be a significant distance downstream of the drop structure. Some of this water that has been forced to the surface will double back toward the drop structure creating an upstream current on the surface of the water. This type of current is a "submerged" hydraulic jump. Energy is being dissipated, but the headwater does not have enough energy to push the tailwater away from the face of the structure. Figure 5 - Anything that floats may get trapped in a submerged hydraulic jump. There are a myriad of ways to prevent a submerged hydraulic jump from forming, however most solutions have serious drawbacks. Some points to consider when designing a retrofit include: cost, safety, energy dissipation, scour, sediment deposition, variable flow, fish passage, effects on headwater depth, and ice passage. For example, the current at Winchester St. develops just downstream of a box culvert, so any changes to headwater depths would be unacceptable. 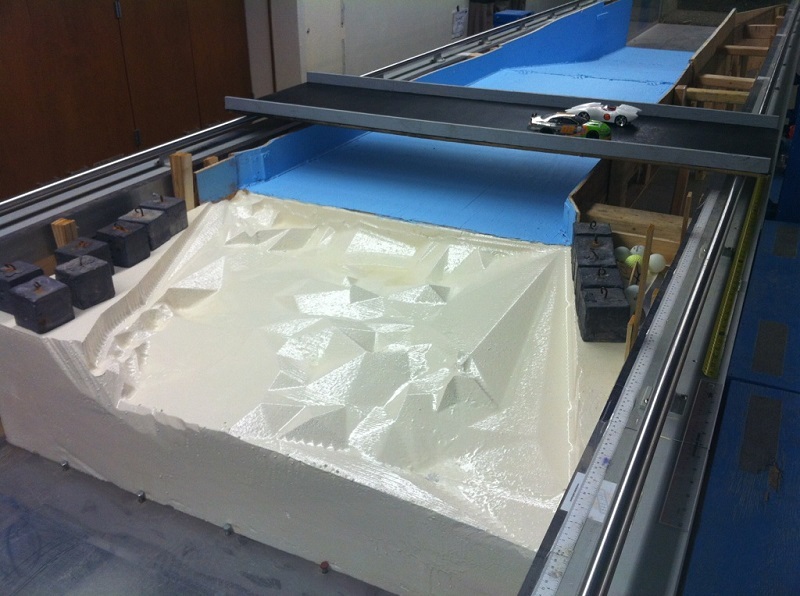 To recommend mitigation measures for the dangerous current at Winchester St. on the Jordan River, a 1:23 scale model was built and tested by John Guymon in the BYU fluid mechanics laboratory. John's model revealed that an apparent scour hole and deposition zone immediately downstream of the structure contributed to the formation and strength of the submerged hydraulic jump as seen in Figure 6. When the deposition was removed in the model, it was found that a weakened submerged jump occurred. If the deposition was left in place and the scour hole filled, a fully developed hydraulic jump occurred right at the face of the structure in the model. Although a fully developed jump at the face of the structure would pass a human, it is sensitive to tailwater depth, and would be susceptible to developing a submerged jump with even minor changes in the channel. With the model scour hole filled and the deposition removed, a swept out jump occurred a safe distance from the face of the structure. If the scour hole were to be filled, the material would have to be grouted into place to prevent scour or foot entrapment. A picture of the model can be seen in Figure 7. Figure 6 - Depiction of Scour and Deposition Zones. Figure 7 - 1:23 scale model of the drop at Winchester St. Flow Starts at the top right and flows toward the bottom left. A promising solution that may be applied to any structure developing a submerged hydraulic jump is currently being developed and tested here at BYU. It is a design based on a crest modification used in the Northwest to safely pass juvenile salmon downstream; a lip is added to the spillway to redirect the velocity of the plunging nappe. A rough image of the concept can be seen in Figure 7. By nearly eliminating the downward velocity component in the plunging nappe, it may prevent air entrained water from traveling downstream along the bottom of the channel and prevent a boil area (Figure 5) from forming. It may also cause a swift downstream velocity along the channel surface, ensuring the safe passage of people. Figure 7 - A modified flip-lip designed to prevent upstream surface velocities.